The Vionic Bella Toe Post Sandal is sweet and pretty up top with serious support underfoot, our Bella sandal will have you celebrating your girl power with every step. Features a feminine bow with the Vionic V logo. Available in Denim, sizes 6-9. Provides proper natural alignment, reducing heel pain and helping with plantar fasciitis. The Vionic Bella Toe Post Sandal adorns a feminine bow with a trimmed Vionic V logo. 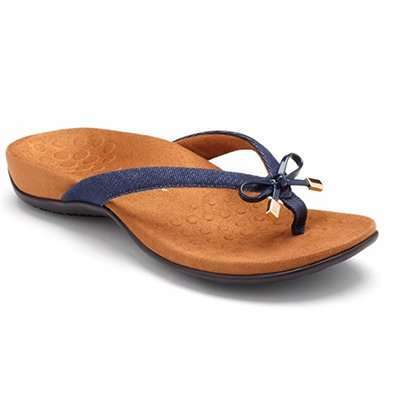 Manmade upper with microfiber covered footbed, makes this lightweight and flexible sandal a must have for the summer. Available in women’s whole sizes in two widths.